One of the most difficult aspects of college life is managing one’s time well. Your productivity depends on how well you keep track of time so practicing your time management skills would be vital to survive and eventually succeed in college. Make sure you have one. It’ll be easier though to have it on your digital devices as you mostly depend on them on a daily basis. 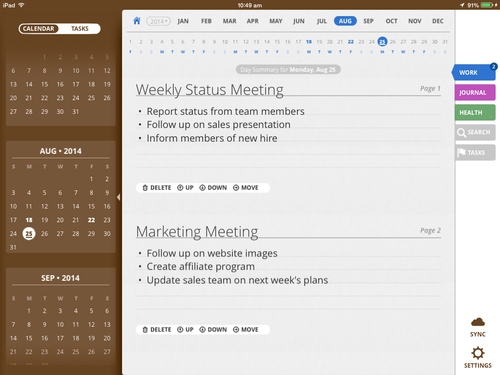 Daily Notes for iPad offers a simple yet effective calendar overview. 2. Jot down notes in one place. Write down every big and little tasks you can think of; your study sessions, extra-curricular activities, social gatherings, personal projects, even laundry and meeting your parents. Schedule everything and make sure you’ll be able to access that easily. Daily Notes lets you create multiple tabs to better organise and categorise your tasks, as well as create a timeline for it; add a due date, make it a recurring task and more. 3. Set time to relax. Don’t forget to just chill and relax. Scheduling a R&R time would be better so you won’t lose track of time. Daily Notes offers a ‘Remind Me function’ as well as a Priority function, letting you rank an activity as a low, medium or high priority. If you’re writing on too many papers, too many devices, try using just one device for accessing your schedule. If you’re not comfortable with it, then just keep looking for a system that would better suit you. Having a set schedule doesn’t mean you’re not allowed to squeeze in unexpected activities. Just make sure to leave some room in your calendar to accommodate surprising events and happenings. It’s the most critical part of managing your time. Figure out how many hours would it take for you to finish a certain project, how much time do you need to research it, how much time do you need to edit, finalise and such. Go backwards from its due date and from there, schedule the time in your calendar. Break it down in a few hours and spread it in a few days or a week or so. 7. Set a “Rewards” Time. ‘All work and no play makes Jack a dull boy.’ So remember to have fun sometimes and reward yourself after successfully finishing critical tasks and projects. Your whole being needs it.